Explore Wendy Dolans artistic process, from layering fabric textures to painting and embellishing with stitching. This beautiful book contains six step-by-step projects, on the themes of Architecture, Landscapes and Flowers. Each chapter features an inspiring gallery of Wendys work, and the final chapter offers inspiration for creating stunning three-dimensional items. 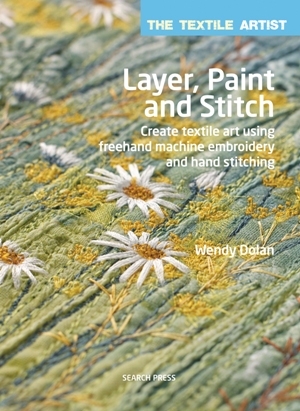 This beautiful book guides the reader through Wendys inventive style of work: from piecing and patching fabrics and creating textures to painting and embellishing with hand and machine stitching. This book contains a wealth of inspiration for any textile artist, showing them how to create gorgeous, textured pieces of art and then, in the final chapter, offering inspiration for how to transform these pieces into three-dimensional items such as cushion covers, notebooks, 3-d vessels, and even a wedding dress, which Wendy made for her daughter. The book contains six beautiful step-by-step projects, broken down into three chapters: Architecture, Landscapes and Flowers, and at the end of each section there is an inspiring gallery of Wendy's work.